Chicago surrealist Rosemont is not particularly coy about the fact that his book Wrong Numbers is an alchemical operation. The work transpires on several planes. On the most obvious, it is an effort to transform the base matter of accidental telephony into the gold of poetry. The book also contains a level of anecdotal autobiography comparable in some respects to Br. DuQuette’s My Life with the Spirits. Yes, the book is actually about the “wrong numbers” of telephone misdialing. In addition to accounts of his personal experiences, the author sidles up to his topic from various angles: historical, cultural, psychological, and even magical. He champions the derided experience of the Wrong Number, not to rehabilitate it as an object, but rather to assail and transform the “miserablist” perspective of its detractors. 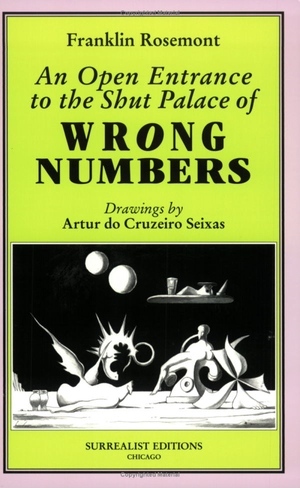 The text is complemented by a set of splendid drawings by Portuguese artist Artur do Cruzeiro Seixas, a surrealist comrade of Rosemont’s. The drawings too demonstrate an alchemical sensibility, in which beings and substances appear transformed, sublimated, and precipitated. This entry was posted in Hermetic Library Reading Room, T Polyphilus: Vigorous Food & Divine Madness and tagged alchemical, Artur do Cruzeiro Seixas, books, bugs bunny, cultural, Franklin Rosemont, fundamental dilemmas, historical, iww, magical, open entrance, Paschal Beverly Randolph, portuguese artist, psychological, Reading Room, reviews, Society, surrealist, T Polyphilus, wrong numbers on April 12, 2013 by John Griogair Bell.